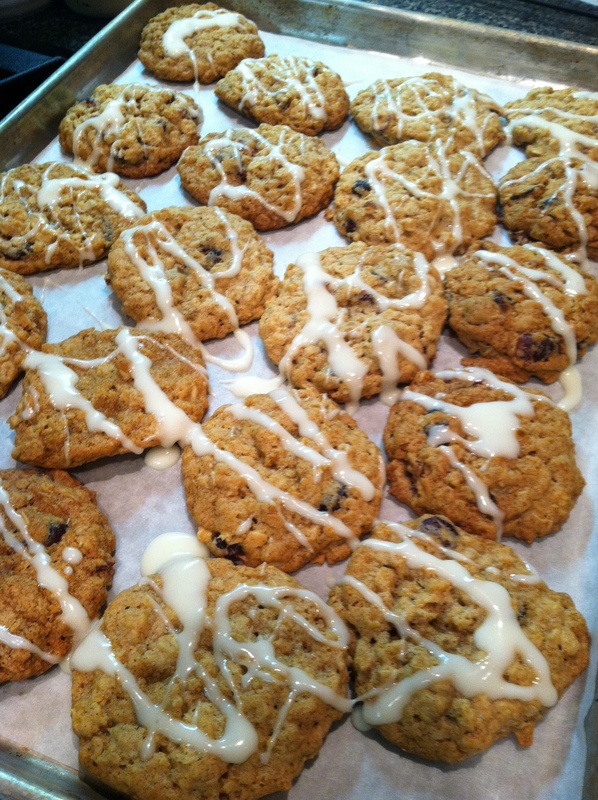 I was asked to bring cookies to a job interview one day so I made a batch of Oatmeal Cranberry Cookies. Walking across the street for the interview, I realized the cookies were still on my kitchen counter. Going in empty-handed was not an option so running home as fast as possible, I grabbed the cookies and waltzed into the interview only a few minutes before it was time to start. Typically being there 5-10 minutes early is preferred rather entering right on time. Luckily I lived close by. I was right about going home to get the cookies. There was a “refreshment” table set with a big empty space for the platter. Milk, tea, coffee, plates and napkins – a successful interview hinged on good cookies. The interview panel was outfitted by the colleges cookie monsters. Being cookie monsters, they were satisfied munching while they took turns grilling me with questions. After the cookie interview, it was required to film a ten-minute lesson of their random choosing. I wondered what they wanted to eat next. After several more interviews over several weeks, they awarded me the position. I always wondered if they were curious why I talked so fast or was out of breath at the initial interview. Probably not. My son called from college the other day and asked for some cookies. These will work nicely. Using an electric mixer, beat the butter and sugars on medium speed until creamy. Combine flour, baking soda, cinnamon, cloves and salt in a large bowl. Mix the dry ingredients together well with a dry whisk, spoon or fork. On low-speed, slowly add the dry flour mixture to the creamed eggs and sugar. 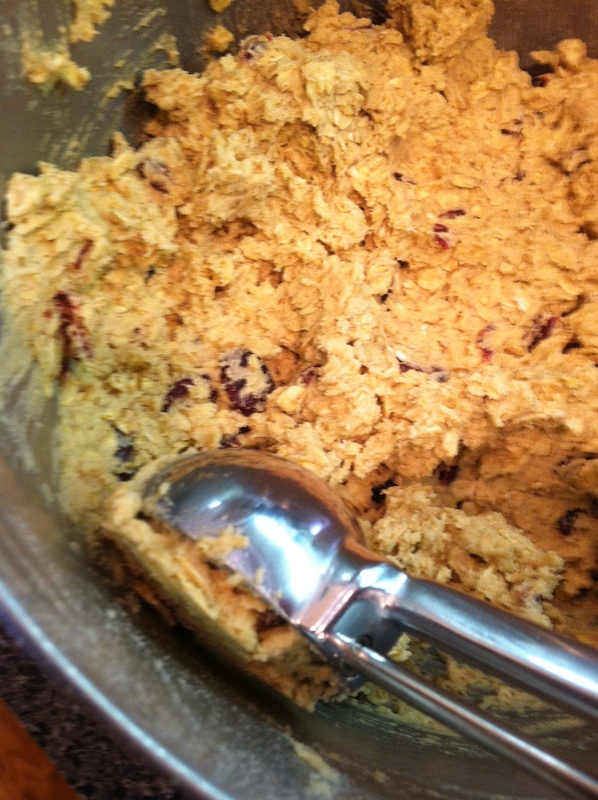 Add the oats, then the cranberries, mix well to combine all ingredients. 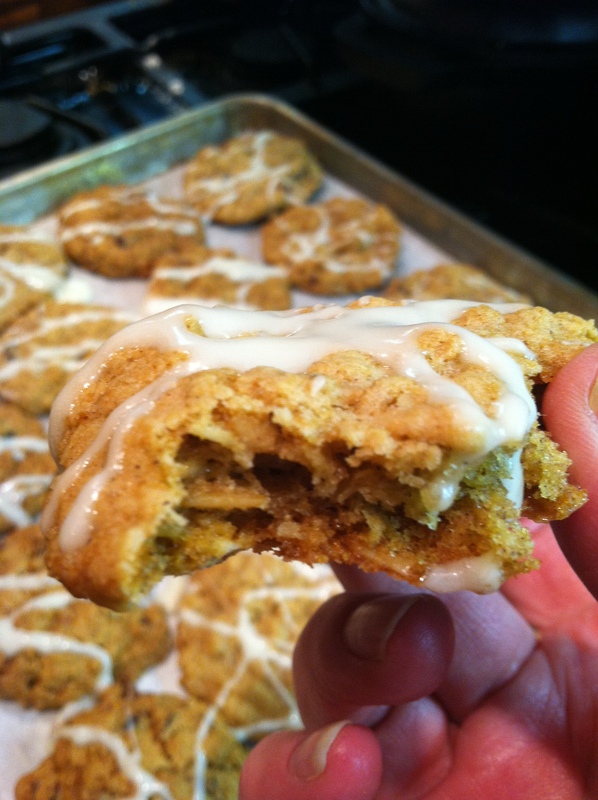 Drop by rounded spoonfuls, or use a cookie scoop, onto a parchment lined sheet pan. Space 2″ apart. Space evenly 2" apart to allow spreading. 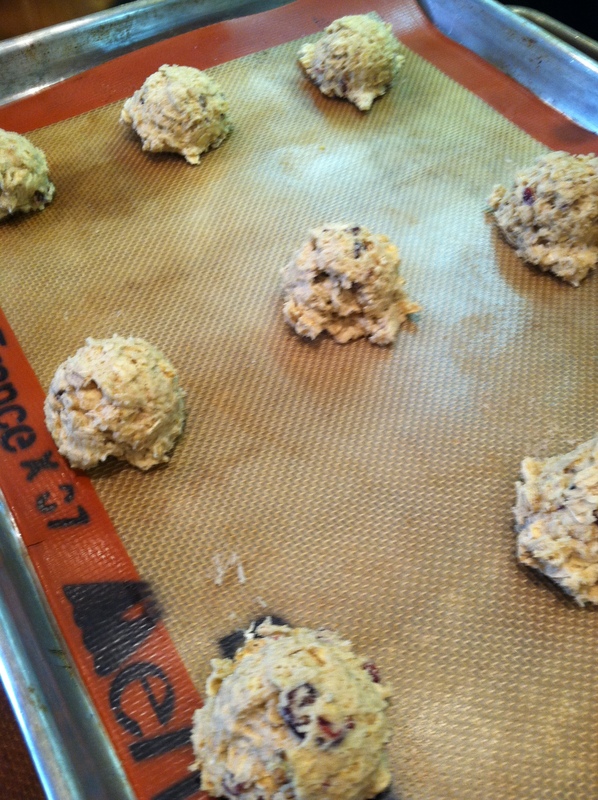 Use silpat or parchment on the baking sheet. Bake at 350°F for 8-10 minutes or until light golden brown. Remove from oven and allow the cookies to cool on the sheet pan for 5 minutes before transferring to a wire cooling rack. Use a spatula to lift the cookies from the parchment. Drizzle the cookies with icing. 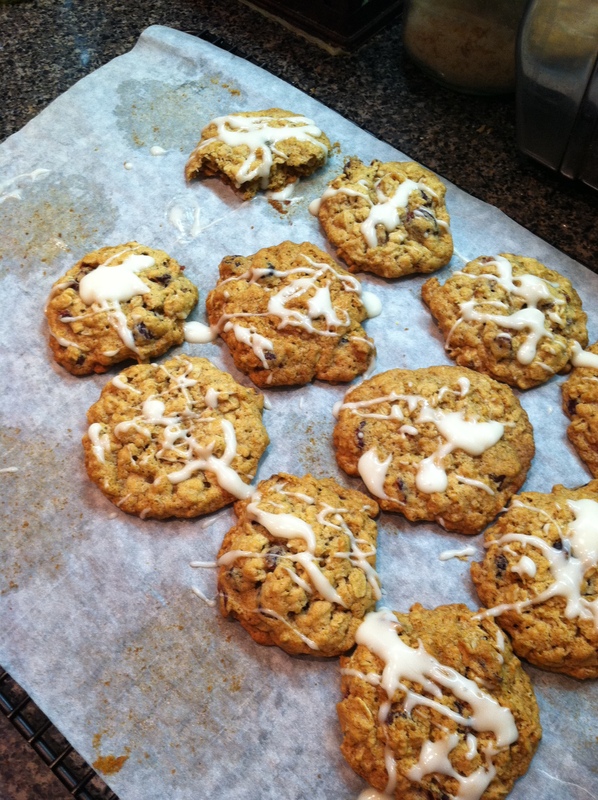 Make note of the parchment and tray under the cookies to catch icing drips. Watch out, cookies disappear before they are finished! Drizzle with fondant icing if desired. 1/2 tablespoon milk and more as needed. Place the 10x sugar in a bowl. Add the milk and stir. Drip more milk, drop by drop, into the sugar until drizzling consistency is reached. It is easy to make this too liquid so start with a small amount of milk first and add while stirring. It changes quickly. Using a fork, drizzle the frosting over the cookies while still on the cooling rack. Allow the frosting to dry before storing in an air tight container. These cookies are best inside of tummies, guarded by a glass of milk or cup of tea. 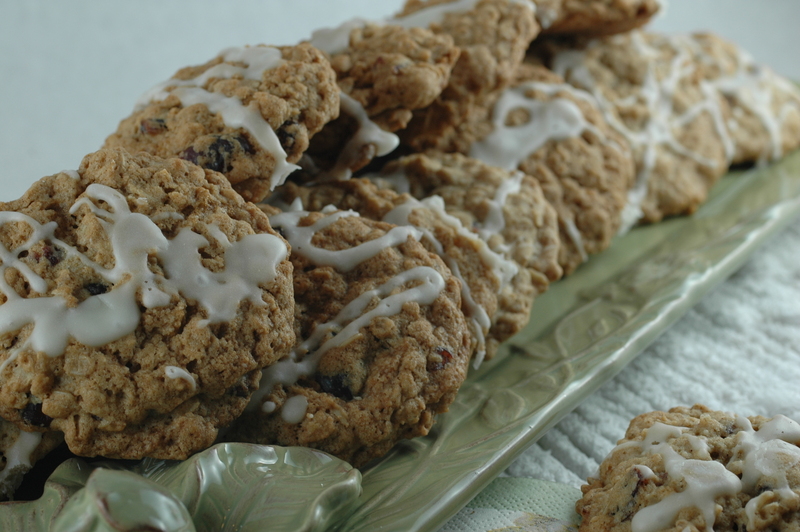 This entry was posted in Recipes, The Life of a Chef, To Tyler: How to Cook: and tagged Bake, classic cookies, Cookie, cookies for college, Flour, oatmeal cookies, oatmeal cranberry cookies, Quaker Oats Company, Sugar. Bookmark the permalink. lovely. love the picture when you show the crumb, so soft and moist. and the intro story was real fun… what type of job interview do you go to bringing cookies? 🙂 I like that! Sometimes you have to plan and prepare a high level meal for the interview committee. I only had to do cookies, then several other “demo” things. A lot people say they can cook, but the “proof in is the pudding” so to speak. What an amazing blog, and such detailed instructions! Entices the reader to bake. Thank you Spice! I hope you try one or all of the recipes here. I am an ardent fan of your blog now! Will keep returning to it for inspiration and reference!